Just for fun, all the points accumulated in the DMV during 2015! Immediately following league at Crabtowne, DMV Pinball will be hosting a quick and dirty IFPA sanctioned 3 strikes tournament. Expected to start between 9:30 – 10pm , non-league members welcome. Justin Day = tournament director. 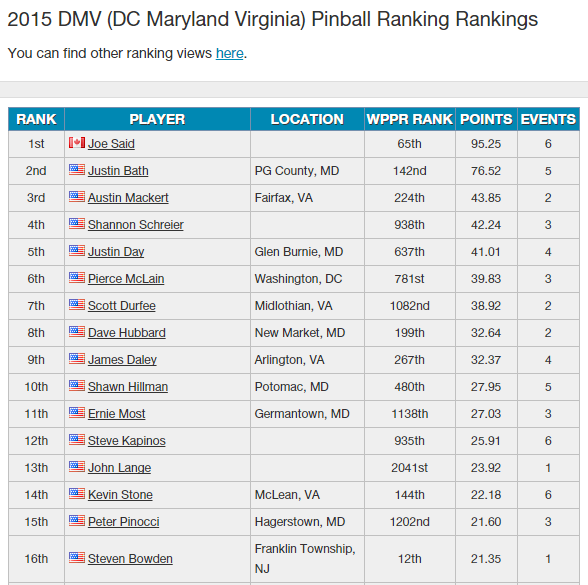 Points will be applied to the IFPA Maryland State Championship Series as well as your 2015 DMV Pinball rank. Spring 2015 starts May 4th! Starting the first Monday in May we’ll have another 8 weeks of pinball. ** There will be no pre-season week 0. 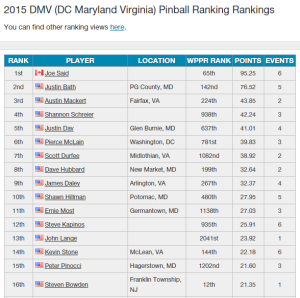 Thanks to everyone who played in the DMV Season 1 Pinball League! DMV PINBALL LEAGUE SEASON 2 BEGINS MAY 4th!! Same locations, same days/times. See the DMV website for details. Invite your friends to join! Pay your dues here. *Instead of 3, we will be playing 4 games per night! *$40 to join. If 50+ people join we will give away another pinball machine. Thanks to everyone who joined us at Lymans Tavern for the finals last Saturday. And a huge congrats to our winners!! DMV Inter-Season Tournament will be held at Crabtowne, USA on April 11th at 1 PM. There will be additional opportunities to qualify the day of the tournament beginning at 12 PM. Tournament will be capped at 32 people. How To Qualify: 2 games, one on Old Chicago, one on Addams Family. One play each game, top score on each tapered down depending upon attendance. Tournament at Lymans Tavern on April 19th! From their FB event page…Last year, In It Together Fest helped support some awesome D.C.-based charitable organizations—Casa Ruby LGBT Community Center and We Are Family DC.This year, we’re aiming to do even more! The organizations we’ll be supporting this year is currently TBA, but they’re sure to be pretty swell. So come out and help us raise money to make In It Together Fest what it was always meant to be: a totally radical display of awesomeness. Stay up to date on your standings and let us know if you have any questions. We encourage members to join us as often as you like each week. Just keep in mind that you must let us know if you’re playing for points or as a guest BEFORE league play starts. Thank you! Congratulations to our Week 1 & 2 bonus game top score winners! The bonus game high score winner from each league location each week is qualified to compete in the DMV Mid-Winter (season) Dance Tournament at Mighty Mikes on February 28th at 2:00 PM. Members can join us at each location to play the bonus game to qualify..that’s five weekly opportunities to qualify! BUT…you can only qualify once for this tournament so once you’re in, you’re in. Give someone else a chance. The award for the most frustrating and amusing game interruption in pinball has to go to the stuck ball. It’s unavoidable. Stuck balls are going to happen. Sometimes they’re pretty cool. Feel free to e-mail your stuck ball pics (or any fun pics for that matter) and we’ll add them to our website. Stuck ball sightings are easy to spot. If during league any of the following is observed, you most likely are experiencing a stuck ball. League members are pointing at their machine quizzically and shrugging their shoulders instead of playing pinball. Players are hunched over the playfield searching with mobile phone lights or snapping pics and laughing. The playfield glass is coming off a machine. Players are taking turns bumping and nudging someone else’s game in play. The league officer steps up to someone else’s game and shakes the machine. Regardless of the scenario, DMV Pinball has a number of rules that apply to the stuck ball. In general standard PAPA rulings apply. Familiarize yourself with the tips below and for more information find the detailed rules on the DMV website. You may attempt to dislodge a stuck ball at your own risk. STAY CLOSE! Ball search may eject ball back into play. If ball search fails alert the LO. The LO may attempt to free the ball by nudging. The player must remain ready to resume play. If the LO tilts the machine it is considered a MAJOR malfunction and the player will receive one additional ball on a new game with the score of the one ball added to the final score of the tilted game. If necessary and possible, the LO will open the machine to release the stuck ball. If the ball drains while the machine is open it is considered a MAJOR malfunction. The rescued ball will be placed on player’s choice of flipper or plunger lane. Player will only have choice of flipper on EM’s. LO makes final call on where ball is placed if in question. Any ball that comes to rest in an outlane, where any portion of the ball is below the outlane post, is not deemed a stuck ball. Any features or modes timed out while attempting to release a stuck ball are considered normal course of play. No adjustments. Loss of tilt warnings due to LO nudging is considered normal play. If more than one ball is stuck, each freed ball will be placed according to the rules, although possibly in multiple locations. If any ball gets stuck during multiball play the player is expected to immediately attempt to gain control of balls in play and get LO for assistance. Intentionally continuing to play with a ball stuck during multiball gives an unfair advantage and will result in a penalty. A ball ending up in the plunger lane during multiball on a machine where there is no autoplunger counts as a stuck ball, and the ball must be plunged by the player. Loss of all but one ball during multiball as a result of a stuck ball is considered normal course of play. No adjustments. Good Luck to everyone this week. Play more pinball. Week 1 is history! See your standings online and verify your results. Please contact us with any questions or discrepancies. Those of you who have read the rules (yes, we know who you are) will notice that we are making a few changes to keep leagues running as smoothly as possible. We will update you as those changes occur. Thank you in advance for your patience and contributions. We’re working hard to get this right. “The LO will write players’ names on the score sheet for game 1 in the order they were randomly drawn. Game 1 will be played in the order as written by the LO. First player listed on machine 1 picks game and goes first. For all subsequent matches after game 1, the player who finished last gets first selection of game or position followed by the player who finished next to last. The player who finished 1st in the previous game will get the last choice. Guests are always welcome and always free to play a round during league. We encourage everyone to bring a friend and share the fun. Guests cannot earn points or qualify for the bonus game tournament. Congratulations to our Week 1 bonus game top score winners! The bonus game high score winner from each league location each week is qualified to compete in theDMV Mid-Winter (season) Dance Tournament at Mighty Mikes on February 28th at 2:00 PM. Members can join us at each location to play the bonus game to qualify..that’s five weekly opportunities to qualify! BUT…you can only qualify once for this tournament so once you’re in, you’re in. Give someone else a chance. Good luck with Week 2. Play more pinball.